Costacos Family Limited Partnership has filed papers with the city to turn a large parking lot at 701 Fourth Ave. into Seattle’s tallest skyscraper — 101 stories — with housing, hotel, office and retail space. A Miami-based developer is proposing a 101-story mixed-use building at the corner of Fourth Avenue and Cherry Street that, if built, would be Seattle’s tallest skyscraper and the tallest on the West Coast. The property owner, Costacos Family Limited Partnership of Seattle, has filed papers to turn a parking lot into a skyscraper, records show. But other public records indicate Miami-based Crescent Heights is the project’s true developer and that the Costacos family has an agreement to sell the half block to a partnership affiliated with Crescent Heights. In early September, representatives of Crescent Heights met with city planning officials to discuss requirements for its project. About a week later, the Costacos family recorded a document that indicates it sold the property in May to a Delaware limited-liability partnership that is affiliated with Crescent Heights. The proposed structure would contain 1,200 residential units, 150 hotel rooms and 167,150 square feet of office and retail space, according to Seattle’s planning department. 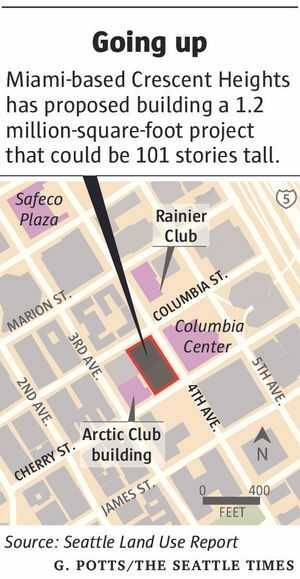 The high-rise could block the west-facing views of the city’s tallest skyscraper, 76-story Columbia Center. The tallest skyscraper on the West Coast is U.S. Bank Tower in Los Angeles, according to the Council on Tall Buildings and Urban Habitat. The 73-floor building rises to a height of 1,018 feet. The Columbia Center in Seattle is 933 feet high. Sanjay Bhatt: sbhatt@seattletimes.com or 206-464-3103.